This Sunday, December 11th we will be opening 3 different houses in Fair Lawn including a recent price reduction and some gorgeous Radburn real estate. Stop by our new office on Fair Lawn ave afterwards and meet with our agents. There are incredible buys and great opportunities this time of year – but it is not the time to go it alone. put The Zamir Group to work for you today! This Sunday, December 11th we have 3 Open Houses in Fair Lawn. They will all take place from 2-4 PM. We feature a variety of home styles and price points, as well as a variety of agents. See one, see many and let us answer all your questions! We have homes in a variety of price ranges and styles, as well as a highly desirable Bergen County town. There really is something for everyone. Experience homes in that range from capes and colonials and some luxury new construction – see how different layouts, architecture and lot sizes stack up against your needs. Experience one of Bergen County’s finest communities to call home (as well as a variety of neighborhoods and school districts within Fair Lawn). 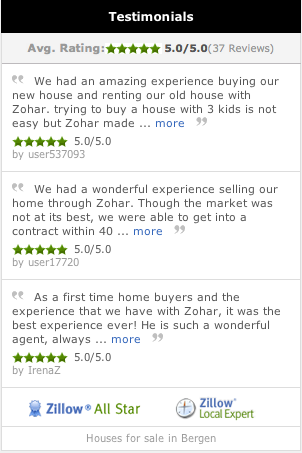 Meet 4 different agents (5 with #1 Ranked Zohar “Zack” Zamir floating around) with different specialties and personalities. Hear about other new listings coming to the market and sign with us – so you will always be the first to know! Swing by one or swing by several – we will be waiting for you! Can’t make it out Sunday? Drop us a line and we can work something out. 5-03 Bryant Pl in Fair Lawn– $339,900 Major Price Adjustment! Move-In ready with abundant charm. Lemonade porch, detailed molding, bead-board kitchen. Updated MEIK and Bathroom, full dormer for large 2nd story bedroom/loft with skylights. Amazing attention to detail and a great space to call home! Elegant contemporary split level with great style and fantastic amenities. Skylights, granite and marble and other amazing design elements are the hallmarks of a home with a luxury sensibility. Full finished basement, master suite and open concept main floor add function to the mix. Newer electric, multi zone heat and A/C and a lerge lot make this a turnkey marvel with nothing needed for years. 42-22 Naugle Dr in Fair Lawn – $699,999 In Law Suite! A rare find and very unique home on the Glen Rock Border. Massive 5 bed 4.5 bath includes a separate suite with kitchen, full bath and living room – perfect for renter or in-law suite. Also a walk-out office area complete with kitchenette. Gorgeous updates to the home including stunning hardwood, modern eat in kitchen, master suite with cathedral ceilings. Fenced yard, great privacy, Radburn schools. One-of-a-Kind! Come meet Ron and Michael! Come meet Zohar “Zack” Zamir! Don’t see the right house for you here? Check out all our listings and reach out to schedule a showing elsewhere. Our group can’t wait to meet you! This many agents in this many houses opens up a lot of opportunities. Ron, Silvia, Michael, Luis and Zohar will be waiting! Allow us to answer your questions about renting and buying in Bergen County, or even talk about the home you have to sell. We can set up no obligation presentations about listing or buying with The Zamir Group, and let you know the value of your home as well as what is available in your price range – no matter what that may be. Speak with us about starting or redirecting your home search today. We stand apart form the competition with a large and experienced team, backed by full time support staff with a dedication to cutting edge marketing and new technology. Need more convincing? Read Our Reviews Here. Can’t make it this weekend? The Zamir Group just wants to see you meet your real estate needs in 2016. Reach out today and let us know when and how we can help!